The past several decades have seen the emergence of diverse movements that seek to address specific problems and provide general improvements to society. Environmentalists have been trying to stop pollution, climate change and resource depletion; civil libertarians seek to stop the abuse of basic human rights and the erosion of democratic institutions; humanitarians are trying to end hunger, disease, and degrading treatment like human trafficking, genital mutilation and genocide, to name a few. And yet, the juggernaut rolls on, destroying more forests, polluting more water, concentrating more power and wealth in fewer hands. The need for change is obviously becoming more urgent, but why isn’t it happening? This latest post by Tom Atlee helps to frame both the fundamental problem and broad approaches to transformation. Please give it your careful attention– then take appropriate action. This is an excellent video–clear, concise and accurate. 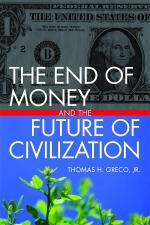 If you want to understand why we have recurrent financial crises, dire want amidst plenty, and why debts keep growing faster than ability to pay them, this is a great place to start.–t.h.g. Tagged A Flaw in the Monetary System? 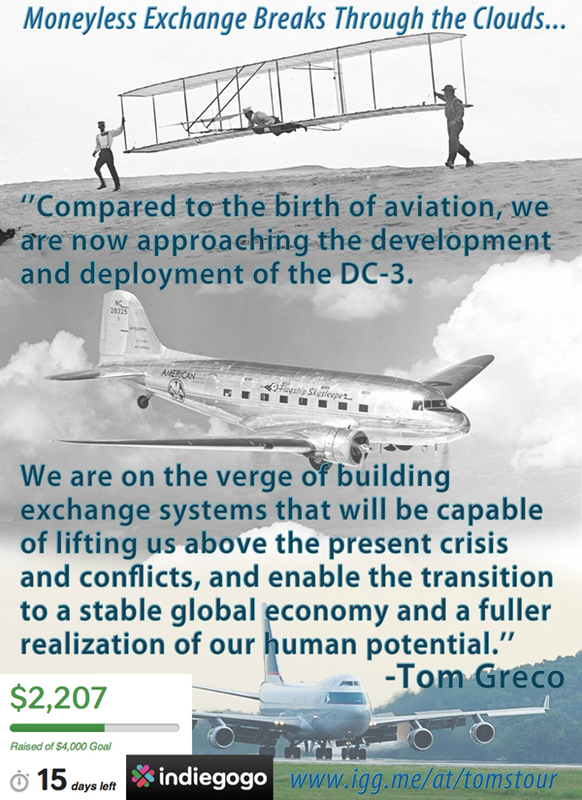 I often compare the evolution of exchange alternatives to the development of aviation. Just as many early attempts to fly were clumsy and poorly informed by good science, so too have been many early attempts to create private and community currencies. But much has been learned over the past three decades, and conditions are ripe for major advances in our ability to rise above antiquated and dysfunctional means of payment. My role is to guide the design and implementation of community based currencies and trade exchanges that enable general prosperity and a stable and sustainable economy. During my upcoming tour of Europe I will be speaking about the power of community currencies and mutual credit, and consulting with communities on doing good things where they are. With still two weeks to go, our Crowdfunding campaign is now more than halfway toward our goal. Thanks for your support, and please help spread the word. Our campaign site is http://igg.me/at/tomstour/x/31801. The current global mega-crisis is forcing us to confront the flaws and inconsistencies inherent in the present dominant structures of economics, money, and finance. As a result, we have before us a great opportunity to open up a conversation that admits to consideration ideas and proposals that may have heretofore be rejected out of hand as radical, impractical, or utopian, ideas like those put forth by Mahatma Gandhi three quarters of a century ago. My good friend and scholar, Rajni Bakshi, has recently articulated that possibility and those ideas in her article, Civilizational Gandhi. You can download the full article here. I also recommend her article, Replacing Keynes With Gandhi. Ms. Bakshi is the Gandhi Peace Fellow at Gateway House: Indian Council on Global Relations based in Mumbai, India. The Rev. Billy and his Church of Stop Shopping–a Terrorist Organization? According to the Mud Report, the FBI has declared that The Church of Stop Shopping to be a terrorist network. Of course, as their sources of money and credit dry up, the majority of people will have no choice about it, but to advocate that they stop shopping prematurely could upset the plans of the global elite. We cannot allow that can we? Tarek El Diwany and Jem Bendell have done a great job in this Al Jazeera interview program explaining the dysfunctional features that are built into the corrupt global system of money and banking. They also cover Islamic banking and mutual credit clearing. This is a “must watch” video.—t.h.g.